Black & Decker The Complete Guide to Patios gets a fresh update with the latest products, even more projects, and all-new photos. With all of the DIY-friendly products for backyard building available today, the only valid excuse not to build your own patio or walkway is that you haven't found the right guide for you. That's about to change. 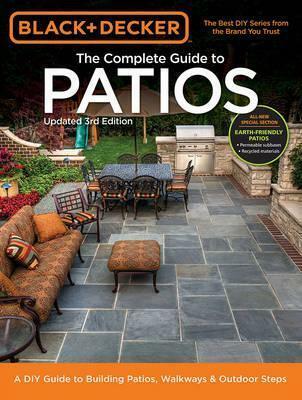 In Black & Decker The Complete Guide to Patios (3rd Edition), the expert editors of Cool Springs Press arm you with thorough, comprehensive information for virtually any patio or walkway undertaking you can think of. An extensive materials and design section helps you wrap your head around all the upfront planning, and the over 30 step-by-step patio, walkway, and landscape projects within are illustrated with detailed, brand-new photographs to guide your progress along the way. Whether you prefer more traditional materials--interlocking blocks and pavers, poured concrete, flagstone, loose gravel and mulch--or you want to be on the cutting edge of the industry with new artificial pavers, geogrid synthetics, and pervious concrete, we've diligently updated this guide to include it all. Finished with a new ending chapter that shows you how to fully customize your DIY patio or walkway, the inspiration inside Black & Decker The Complete Guide to Patios perfectly aligns with all the needs of today's do-it-yourself homeowner.